Today we bid farewell to the FastWay Supermarket in North Sydney. 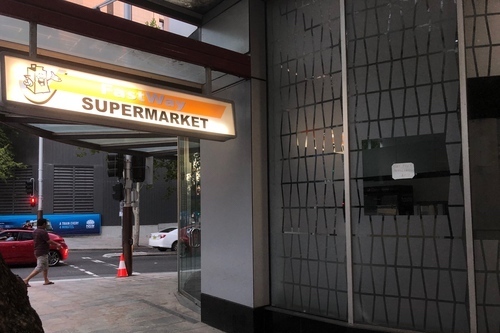 It opened in early 2018, but didn’t last long before the Woolworths opened less than a block away on Miller Street. Truth be told I barely shopped there, but the cheerful clipart paper bag made me smile every time. Even though his store is but a twisted mess of empty shelving now, he still lights up each evening. It’s a shame he couldn’t hold on, I’ll bet he would have had more customers by the time the new Victoria Cross Metro station opened across the street.